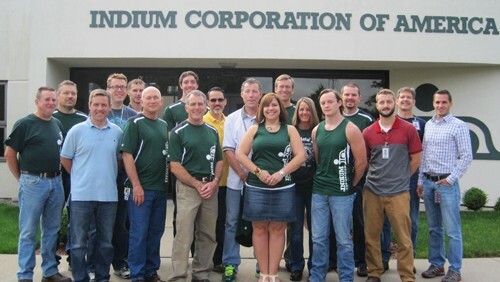 Twenty-five Indium Corporation employees will participate in the 2015 Boilermaker Road Race on Sunday, July 12 – the largest group in the company's history. As Utica's Technology Company®, Indium Corporation is proud to support these employees who are continuing the company's longtime tradition of Boilermaker Road Race participation – one of the many company events that Indium Corporation participates in year-round. Of the group, 20 race participants will run in the 15K, while five will partake in the 5K. "While Indium Corporation employees are engaged in numerous community events throughout the year, the Boilermaker brings with it its own sense of exhilaration and regional sense of pride," said Mike Dunn, captain of Indium Corporation's team. "I'm especially excited to be part of company history by representing the largest team to participate yet."